Playing and exercising with our dogs is extra important. Dogs need stimulating play, exercise, and human interaction to thrive. All of these things are important for both their physical and mental health. Plus, playing and exercising with your dog is good for your health too. I have mentioned before several times how much my dog motivates me to be active. Some of the fun games that I play with Shiner outdoors include tug of war, fetch (kind of), chase, and catch. For the past few weeks, we've been playing with the interactive training device called the PULLER made by a company named COLLAR. According to PULLER's website, using the PULLER with your dog for just 20 minutes is comparable to 3 miles of intensive run or a two hour training session with an instructor. I will admit that Shiner does seem to get a pretty good workout when we use our PULLER. I know what you're thinking - it looks like a toy, how is it a training device? I thought the same thing. Regardless of what you want to call the PULLER, it all amounts to the same thing - a healthier and happier dog. The Puller comes with two rings (also available for smaller dogs). 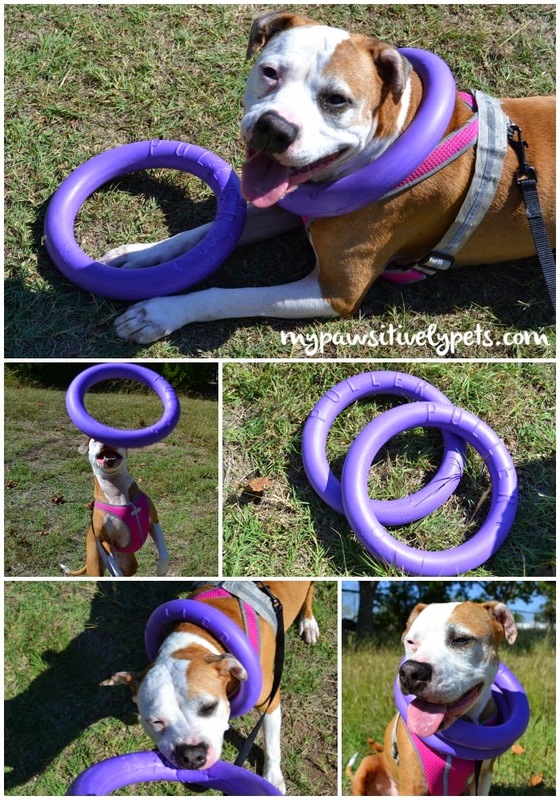 The reason for this is not so that your dog can have more PULLERs to play with, but to aid with training. It can be useful for teaching a dog to fetch. Shiner is not a fetcher and never has been. She'd much rather make me chase her to get whatever it is that I threw for her in the first place. A PULLER is supposed to make it easier to coax your dog to return the item to you for a fair trade. When you throw one PULLER, trade it out for the second one. I'm still working on this with Shiner. As you can see in our video, she seems to think that one purple ring is just as good as the next. But she still has fun chasing it when I throw it and she loves to play catch too. One unique property with the PULLER is the material it's made out of. It's soft, foamy, and bendable. Apparently, this material does not damage a dog's teeth and gums. When being bitten, PULLER gently lets a dog's teeth sink into the material without losing it's shape for long periods of time. According to the website, "all dogs like this effect and fall in love with it". And I think that totally makes sense. 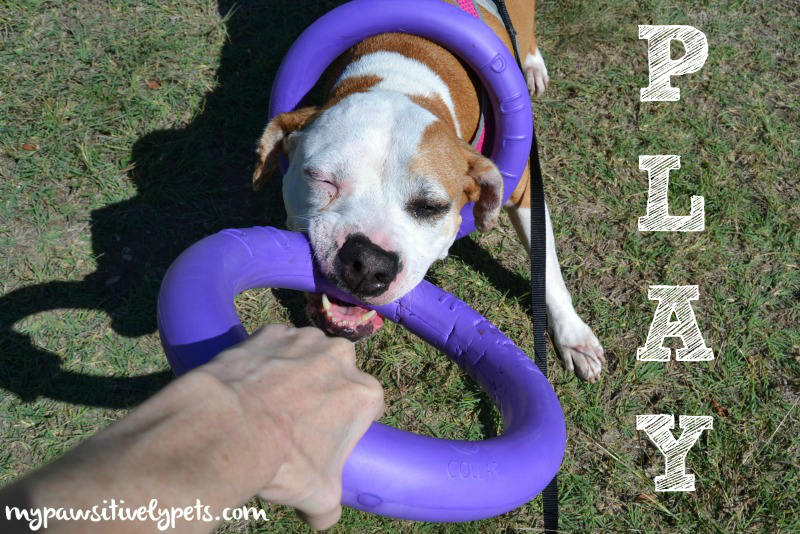 The PULLER has proven to be very durable during our play and exercise sessions and Shiner loves it! Do not mistake the PULLER for a chew toy, however. If I were to allow Shiner to sit and chew on the device, she would destroy it most likely. It's not meant to be a chew toy and so when used properly I think most people will have positive results with it. To purchase PULLER, you can visit their website here. They are also available for purchase through Amazon. 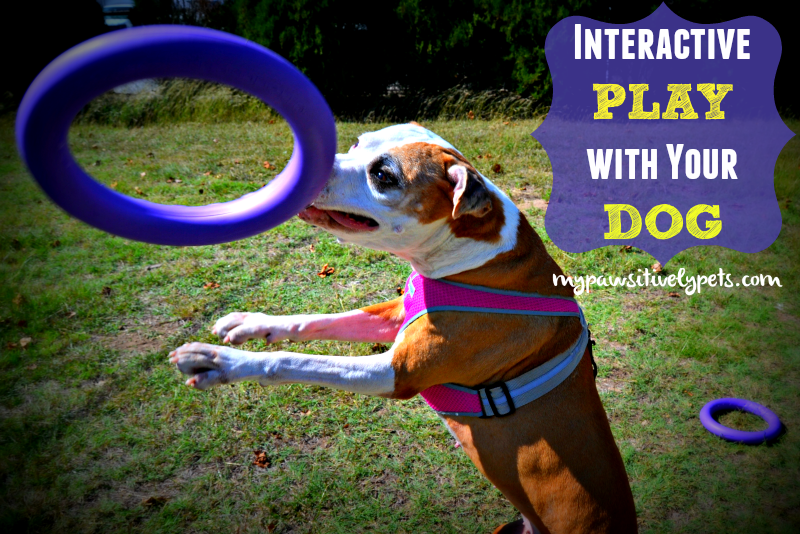 Play and exercise with your dog can be FUN and it's definitely important to their health. There are lots of games and training ideas you can come up with using the PULLER. Let us know what fun games you play with your dog in the comments! 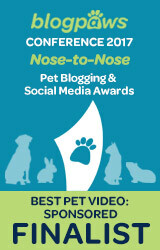 Want to win a PULLER to try with your pooch? We have 3 PULLERS to give away to 3 lucky winners! 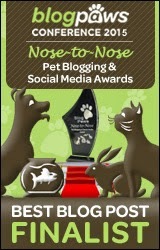 The winners will be able to choose the size they need for their dog. This giveaway is open to US and Canada (excluding Quebec and where prohibited by law). Ages 18+ only may enter. Giveaway ends 11/20 midnight CST. One winner per household. Good luck! This post is sponsored by PULLER. 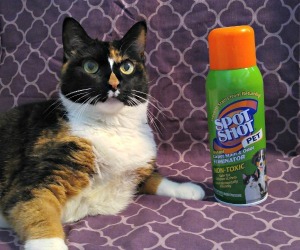 We were compensated for our time reviewing and sharing this product, but Pawsitively Pets only shares information we feel is relevant to our readers. All opinions expressed here are our own. This post does include affiliate links. Pawsitively Pets is not responsible for shipment of prizes. Shiner sure looks like she is having fun with that! I think Luke would enjoy it too...but he'd definitely want to chew on it and destroy it! I would like to teach him to play fetch better too....he's great at retrieving but then wants to play keep away instead of bringing it back. I bet since he is still so young you could probably teach him! Shiner just seems so set in her ways. She is VERY stubborn. I'm not saying old dogs can't learn new tricks, but she just seems to like to do things her way lol. I've started working with Luke, doing a "trade" to get him to give the ball back. We'll see how it goes! I'm interested in the PULLER because when we play tug with Toby he quits in a few minutes. I think it does hurt his teeth or gums. I don't know if anything will get him to fetch but we'd sure love it if he did. I have 2 Vizslas. They love to play tug of war with each other. They like to fetch but only for a short time. The PULLER would be great because they if what they love to do BEST in have you play tug of war and see who can win...it is usually them because they pull so hard. Some times the things we are playing tug of war with rips or breaks. This is perfect for my dogs! We just fenced in our yard and are trying to teach Luma to fetch, so this would be great! I love how durable they look! That looks like loads of fun. Harley has finally figured out how to fetch - been trying for years to teach that one! Might have to add this one to our holiday wish list. Thanks for sharing. Well good for you Harley! Maybe Shiner can get to her goal of fetch one of these days. That sure looks like fun and Shiner seems to be enjoying it. Have a super Saturday. I would love to win these because my huskies are not much for fetch either, I would love to try and persuade them with these. Our dogs would really like this! We have an 8 month old puppy and she love tug games and somewhat likes fetch. (She likes fetching discs). My chihuahua Riley loves to fetch and tug! He would absolutely love the PULLER and it sounds like it would be safer for his teeth. That looks pretty sweet and I know Laika would love one; fetch and tug are two of her favorite things. Love the video; Shiner is such a happy girl and I love seeing her so excited for a fun toy. My sisters and I really don't like rubber toys too much. Katie and Bailie pull and tug a lot, but only with ropes or stuffies. These would be great for most dogs that are "normal". It's not really rubber... the material is hard to describe. I guess maybe similar to rubber and foam combined? Honey loves to play fetch and tug. Sounds like the Puller would become a new favorite. Theo loves to fetch and tug, but doesn't like to let go long enough for anyone to throw it. I worry about his teeth when we play tug of war. He may be small, but he's fierce. My pugs love to play tug of war. I think it would be fun and it might help teach them fetch. Oh my gosh, Shiner is so cute in the video! I love how she shakes the toy and how she prances off with it. You're right, she is in great shape for an "older" girl! Ace would love to win the PULLER because he loves fetch but he also loves to play tug and we've been trying to do more of that lately to give his stiff joints a break. I have a very playful Springer Spaniel and I think he would love this! Thanks! With two high energy dogs, I'm always on the look out for toys that will keep them moving and drain some energy. Ziggy love splaying tug o war! my dog loves all toys, even our kids stuff, she can always use more stuff to call her own and have fun with! Kimberly swears by the puller. Says it's super durable, which is a big deal. Thanks for hosting a giveaway! I'd love to win one.